Over the last 25 years, we have always traveled with a dog. Mercy “Bucket”… a 75 pound German shepherd was an awesome travel companion and member of our little family. She passed on Mother’s Day in 2008 at 15 years old. After a short grieving period we got Gandaulf. We were looking for another Adventure Dog that could keep up with our travels but this time without the size and hairiness of a shepherd. The Corgis are a working breed just like the shepherds, with a lot of the same mannerisms, easy to train and always out to please. Gandaulf came to us as a rescue at 10 weeks old. How could a dog with such short legs keep up with our hiking, climbing, rafting and travel abroad? He would get high centered on the Sunday papers in driveways on our walks, high centered on tennis balls… but boy could he jump! It wasn’t long before his first 2 mile hike, camping trips and rafting/fishing trips. He was a natural in the outdoors. Gandaulf is now 7 years old and shows no sign of slowing down. He has been to more countries than most humans. Every year he has his own calendar showcasing his travels… he’s a natural in front of the camera. This adventure will be a test of his patience and travel savvy. When Chris and I decided to “hit the road”… we vacillated between flying to one destination, settling in for a short while… getting healthy and traveling out from a home-base. 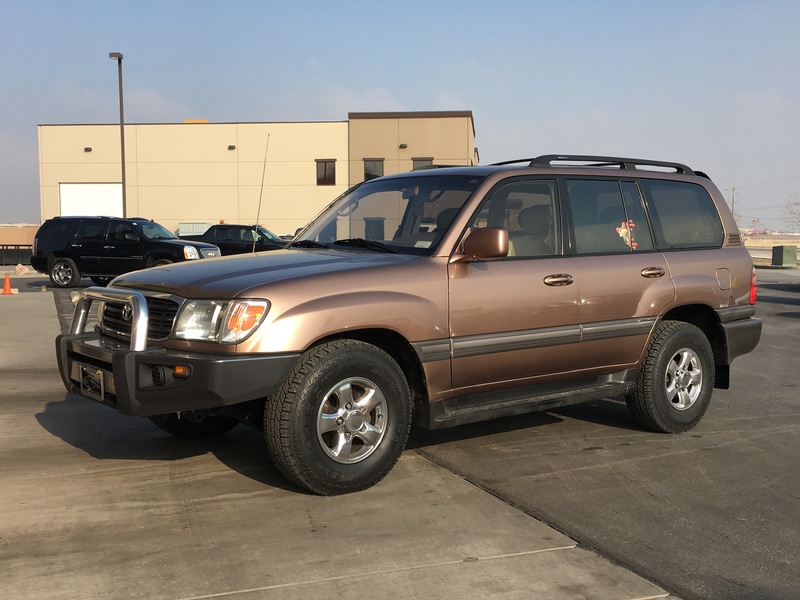 In October 2016, we bought a 1998 Toyota Land Cruiser and a light went off. Why not go Overlanding? Drive down into Mexico and through all of Central America, west coast and back up the East Coast… and wherever the road takes us. Some modifications needed to be done in order for this stock Land Cruiser to be road worthy in Central America. We started out with an ARB Sahara front bumper. Next came upgrading the headlights to a set of LEDs… don’t want to hit a cow in the middle of the night… Next came beefing up the suspension, not too radical after all we are a couple middle aged women and a short legged Corgi. We put on a full set of “KYB Excel-G Shocks”, beefed up the tie rod ends to “Proforged Chassis Parts Tie Rod Ends” and upgraded the tires to “Yokohama Geolander A/Ts” for a nice deep tread and strong sidewalls for off-roading… but not a noisy road tire. Lucky will become our Adventure Cruzer. Still to come… a “Geo Adventure GT-180” fold out roof top tent with annex, interior build for storage… solar panel and backup deep cycle battery with an 800 watt power inverter for charging laptops, phones and running our “Edgestar 43 quart fridge“. A mounted lock box for securing personal items during travel. Off-road lights and an 8,000 lb winch. Two middle aged gals and a Corgi as the icing on the cake. So the biggest challenge that faces us is liquidating everything we own. It is amazing to me that two people can collect so much “stuff”. Our first house was 1300 sq. feet. It was two bedrooms and a living room and a kitchen… simple and never too cluttered. As with the American dream, and the desire to pay as little to the Man as possible we moved into a 2600 sq. foot home. More rooms and more “stuff”. Our third home, the one we currently occupy, 6500 sq. feet and even more “stuff”. Lots and lots of “STUFF”. The bigger the space to more room to accumulate. If you asked me to name two or three things I could not live without, I would tell you some trinket, object or maybe a favorite bed. Ask me what I would grab if my house burnt to the ground… I would answer my GF, dog and cat, and perhaps iPad and cell phone. Isn’t it sad that aside from living things I would probably rank my media devices over anything else. Actually my past 20 years is stored on those devices so it would be like my grandmother grabbing her family photos and memoirs. Of course we do have “the cloud” so these devices are actually just material items. Last year we began to eliminate the clutter. Can I tell you how freeing it is! Just last weekend we filled two 50 gallon garbage cans just from one room in our house. We have donated clothes, blankets, pillows, and other miscellaneous sundries that have been gathering dust for years. We are down to just the bare needs in the kitchen. Our closet of clothes that once spilled into two walk in closets has shrunk into less than one. Of course a girl must have her shoes so it has been hard for Chris to part with those, even though she hasn’t worn them in years. Our goal is to have everything we own fit into a 1998 Toyota Land Cruiser. Like a turtle our home will be on our backs. This is not our first rodeo, we’ve done this before in 1992-93 when we hit the road in a 24′ fifth wheel trailer for over 10 months. We traveled all over the USA until we ran out of money. This time we are MUCH older and wiser and have more “STUFF”. This time we will be gone for 10-15 years or longer, till death do us part… This time the emphasis will be on spiritual growth and the accumulation of memories rather than treasures.